The following three-step process for tying the two half-hitches is also explained in the image gallery below. Click on the images for high-resolution versions. Begin by forming a clockwise loop around the pole, with the working end of the rope on top. Bring the working end through the loop. At this point, you have an overhand knot around the pole. Bring the working end down and to the left. Loop it under the standing end. Pull the working end through the loop just formed, tighten, and slide the knot along the standing end up to the post. 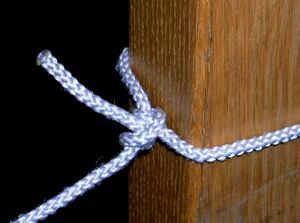 A correctly tied two half hitches resembles a clove hitch tied around the standing end of the line, not a lark's head. To release the knot, pry apart the two hitches with a bending motion. This page was last edited on 31 March 2007, at 00:21.